What other names for Santa Claus are used around the world? Today’s Wonder of the Day was inspired by max. max Wonders, “who is st. nick” Thanks for WONDERing with us, max! Have you been nice this year? Or have you been naughty? Maybe a little bit of both? There's one person who knows for sure. That's right, we're talking about Santa Claus. Every year, he makes a list — and checks it twice — to find out who's been naughty and who's been nice. But several weeks before Christmas, there's another day that many children around the world look forward to. The day is Saint Nicholas Day, and it occurs each year on December 6. "St. Nick's Day," as it's sometimes called, is widely celebrated in Europe, as well as many communities in the United States that have strong German, Polish, Belgian, or Dutch roots. The day celebrates the legend of the goodness and generosity of Saint Nicholas. Nikolaos (that's “Nicholas" in Greek) was born in 270 A.D. in a small Greek village on the southern coast of what is now Turkey. He dedicated his life to serving God and grew up to become the bishop of Myra. Nikolaos was believed to have performed many miracles in his lifetime. In fact, he was often called "Nikolaos the Wonderworker." According to Christian tradition, Nikolaos was named a saint in recognition for his many miracles and good deeds. Saint Nicholas died on December 6, 343 A.D. The anniversary of his death became a feast day of celebration — Saint Nicholas Day — on December 6 each year thereafter. Saint Nicholas also had a reputation for giving secret gifts by putting coins in people's shoes during the night. Today, according to tradition, children put their shoes outside their bedroom doors on the evening of December 5. Saint Nicholas visits overnight. Then, on the morning of December 6, children awake to find their shoes full of small gifts and candy. The celebration of Saint Nicholas Day in early December, along with his reputation as a gift-giver, has led many to associate Saint Nicholas with Santa Claus. Some people even call Santa Claus by the nickname (pun totally intended) "St. Nick" from time to time. Of course, St. Nick isn't the only other name Santa Claus goes by. Around the world, Santa Claus has many different names. Step up to the plate and get ready for a Wonder of the Day full of little round delights! Do you celebrate Saint Nicholas Day? If not, why not start? On December 5, set your shoes outside your door. Be sure to let your parents know why your shoes are there instead of being put away where they're supposed to be! In the morning, check your shoes first thing to see if Saint Nicholas visited. Did he leave you any coins or candy? We hope so! What other holiday traditions does your family observe? Depending upon where you live, there are all sorts of special holiday traditions. Have you ever heard of the legend of the Christmas pickle? According to an old German tradition, you are supposed to hang a pickle as the last decoration on your Christmas tree. This should be done by your parents and it should be well-hidden amongst the branches. On Christmas Day, the first child to find the Christmas pickle receives a special blessing for the coming year and an extra gift. Maybe you can start such a tradition with your family this year. When it comes to gifts, it's really true that it's better to give than to receive. You can even find out for yourself this Christmas exactly how great it can be to give gifts to others. Think about those people in your life who make each day so much better. Whether they're parents, relatives, friends, neighbors, or teachers, there are many people who make our lives WONDERful on a daily basis. Make a list of the WONDERful people in your life, and then think of some small token of your appreciation that you could give each person this Christmas. It doesn't even have to cost anything. A simple handwritten note of heartfelt thanks can be a gift that will be treasured for years to come! 👋 How're you doing today, Tyler? You're entitled to your opinion, Wonder Friend! **pokes self** Ouch. No, we're not a bot. We're sorry you think so, Tyler. santa means satan if you mix up the letters! Also, buyout is scrambled YouTube. That's so nice that you have opinions, Preston! Everyone else is allowed to have theirs as well! There are definitely conflicting viewpoints on this topic, ayden bartlett! Thanks for stopping by. Love this article on St. Nick's day. The jury is still out on that, tyler ninja! Santa doesn't come unless you're asleep, though. There are a few conflicting opinions about this one, but we thank you for sharing!! Wonderopolis launched October 4, 2010. And, everyone is allowed to have their own opinion. Cool!! Thanks for sharing with us, Little Mouse Lover! Have you ever been to Bulgaria? Yep! Many times! I was even born there! That's awesome, Little Mouse Lover!! What is your favorite part of visiting Bulgaria?? Hey Ryder! Thanks for stopping by and WONDERing with us! How did you like this Wonder? Happy early Christmas to you as well, HeadshotGenerations! Santa Claus is awesome he is the best man ever. i still don't think there is a Santa clause. I loved reading this wonder! My class reads wonders almost every day at the beginning of literacy. Does Santa come on December 30 or 28? santa claus was saint nick. Does Santa Claus go down a chimney or go though the front door? i am polish so i celebrate christmas on christmas eve and december 5 is santa birthday so we get toys and on christmas eve my whole family comes and we bring presents for everyone but santa delivers presents to us to and we feed the reindeer too!!! i thought it said he wasnt alive? I love this article it's so cool! I wonder why Santa Claus has so many different names? I hope you wondrous people keep making wonders cause I really enjoy them! Hi, that video was great good job, wonderopolis. Keep believing. GO SANTA AND ELVES!!!!!!!!!! I liked your potatoes see with eyes question, and I am most definitely using your website. Well, Joe, we get our great ideas from Wonder Friends like you! You can submit your own Wonder questions here: What Are You Wondering? Hi! We love Wonderopolis! You may remember us from Room 20 5th grade Mapleshade School. We are in that class. We are excited to see tomorrow's Wonder of the Day! Your website is awesome! It rocks! WHY ARE BEANS AND CHEESE SOOO GOOD????? My teacher told me to leave a comment on here because she really likes this site. I agree with her, but I think you should do an article on narwhals, and why they have a tusk. They are really cool. How did you come up with the name Wonderopolis? Hi, I am Harshitha from Mrs.Caplin's class. My traditions are like dancing, singing, languages, religions and more, and dancing and singing are various types of them. One thing about singing is, when we start learning to sing, we always learn songs about Hindu gods. When someone just starts learning music, there is some basic stuff to learn than only we can learn by singing songs. There are many books of song to learn. If you finished all of those books, only you can be a music teacher. In the dancing, it is the same thing as music except you need to do some kind of step before you start the basic steps. (That is called NAMASKARAM). In my previous school, the main languages are: Tamil, Hindi, English and Sanscrit. Religions are: Christian, Hindu and Muslim, and also there are communities of Hindus and also intercommunities in communities. India has various diversity and it has a unique democratic government. In India, we don't have any rules that we should not litter in the road. So, the streets will not be clean. The women will wear traditional clothes called saree. I lived in a state called Tamil Nadu and I also talk Tamil with my family. Tamil Nadu is in the way down but it is not an Island like Sri Lanka. I don't even know that India is in the second place in the population until I read an article. We have many gods like: Ganesha, Krishna, Shiva, Balaji, Murugan, Durga Davi, Raman and more. The great two epics in India are called: Ramayanum and Mahabharadham.There are many languages in India. The nearest state to my sate (where I live is my state) is called Kerala. Taj Mahal is one of the 7 wonders which is in Delhi and Delhi is the capital of India. Architects will make a statue of gods in India. Temple is what we call the place were the statues are worshiped. The man who sings some songs and put some flowers under the statue's (gods statue) leg is called the Priest. The Priest will put yogurt or milk on the statue. This act is called abishegam. They will wash the statues with water. Once when we worshiped, I saw my dad and grandma eating a part of the banana leaf. I also tried it and it was really funny when we eat it. Women or girls will put some designs which come from some kind of leaf. Women or girls do it for marriage or some kind of functions. Well, thanks for giving me a chance to share my traditions and I am going to learn more about my traditions. You should do more articles about animals, especially cats. Hello. The video was cool. I don't even know what St. Nicholas Day is, so peace!!!!!! That video was so cool! This was so cute!! :-) I want to know what Santa's favorite cookies are, though!!!! What site was that video on of the Santa Claus thing? I think that this wonder was amazing. I didn't know Saint Nick was born in 270 A.D. I also didn't know that sometimes he was called Nikolaos the Wonderworker. My family doesn't do the pickle tradition, but maybe I will try it this year. I thought that everybody worldwide just called him Saint Nick or Santa Claus, but I learned from this wonder that there are many different names. This was a marvelous wonder. Wow, Wonderopolis! I didn't know he had that many names! I especially like the Italian one because I'm Italian. I can tell my grandparents that 'Babbo Natale' came to my house! Awesome! I love Christmas. Your blog is very cool, too. I also didn't know there was a St. Nick's Day. Looks like we do learn something new every day. Hi, this is Leah and I'm back! Last night, I put out my shoes in my doorway and today when I got up to brush my teeth, I had completely forgotten about it and I tripped over my shoes! I found two big delicious candy canes in my shoes! I thought it was a fun experience and I'll be sure to do it next year! Hello, I loved this wonder because I liked the cool Santa Clauses of the world. In class, we are reading a book about a hobo in Paris living under a bridge at Christmas time, and the story talked about Father Christmas. Thanks. Don't forget to leave a carrot or a turnip in your shoe as a present for Sint Niklaas' beautiful white horse. It loves an occasional sugar cube, too, but that's not very healthy for a horse. Hi, I am Harshitha from Mrs. Caplin's class. I never knew there was a man called Saint Nicholas. I don't celebrate St. Nick's day, and I never did it. I heard this today only in this cool wonder. I don't know that many countries celebrate this holiday. I have my own tradition. I celebrate South Indian traditions. I wonder...how did Saint Nicholas give us candy and stuff even though he died in December 6, 343? Well, thanks for the new information I learned today about Saint Nicholas! Hi, Wonderopolis! This wonder is superb. I learned that Saint Nick in Sweden is a little brownie, while we have him as a grown man. Why is St. Nick's Day on December 5th? How many years has St. Nick's Day been around? I am wondering how they say St. Nick in Asia? I learned a lot from this wonder! I think tomorrow's wonder will be about president Abraham Lincoln! Let's celebrate each nation's Christmas traditions. It will be a month long birthday party! Wow! That's so neat to have what Santa Clause is called in different parts of the world. Now, on Christmas night, I can say to my parents, "I wonder what Babbo Natale will give me this year?" They'd have no idea that I was speaking Italian. I also never knew that anyone knew or had a specific time or date that Santa was born on. I never knew that he was born in Greece in 270 A.D. (How do people know this stuff!)! I also thought that leaving your shoes in your doorway for Santa to put candy and goodies in was pretty cool. In first grade, our whole class did that, and I put out my red sparkly slipper, and the next day it was filled to the top with candy. But, I didn't know what day to do it on (to put out the shoe) and since today is that day, I think I'll try it tonight! But, I wonder why a shoe? I mean, wouldn't it make more sense to put out your stocking? And a shoe is a place where you put your stinky feet in!? I'll try to comment back later to tell you if the whole thing about putting your shoe out in the doorway works! Well, anyway, thanks for this wonderful wonder! I learned a lot so thanks a lot!!! IT'S MY BIRTHDAY TOMORROW, and in the video, how Santa goes around the world in one night? Soooooooo cool! Hi, I'm Mukund from Mrs. Caplin's class. I learned that they call Santa many names in different countries. We are reading a book in class that is called The Family Under The Bridge, which takes place in Paris. They call Santa Father Christmas in Paris. I learned that St. Nick's day is December 6. I also learned that Saint Nick was born in 270 A.D. and died in 343 A.D. I learned that he was born in a small Greek village. I really liked this wonder. Have a good Saint Nick's Day. Dear Wonderopolis, I think the St. Nick in Sweden is very different from the others. In my class, we are reading a book called Family Under the Bridge which is in England, and in that book, it talks about Father Christmas. I never knew that there was so many Santas around the world. Cool! I love St. Nick. Doesn't he come tonight? Well, have a Merry Christmas! See you tomorrow! I think tomorrow's WONDER will be about Abe Lincoln. He didn't tell lies and he was very, very, very, very TALL. I think that St. Nick is a person that delivers presents to all the good boys and girls. I have a question if St. Nick is dead, then how does he still deliver presents? My family, for Christmas does not do much, but we set up lights and decorations. I have learned a lot about these articles. I did not know that there was a holiday called St. Nick's Day, but I think that I will go home tonight and tell my family about it. I was wondering...if St. Nick died on December 6 343 A.D., then who is Santa? Really a ghost? I really liked this wonder! 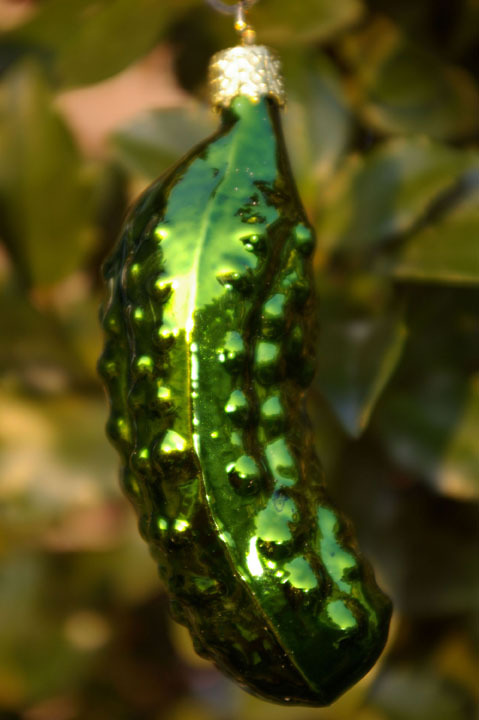 I liked learning about the Christmas pickle, and also liked to learn about St. Nick's Day. My question is, if St. Nick died December 6, then how does he still deliver presents? What my family does on Christmas is, we decorate our tree and decorate our gate. We also set out milk and cookies. Now I know who St. Nick is. I will set my shoes outside tonight. On Christmas, I go to my grandparent's house to eat. We think tomorrow's wonder is about Abe Lincoln, because he cannot tell a lie and he is very tall. Or it is a tall tale. Saint Nicholas Day occurs each year on what date? Saint Nicholas had a reputation for giving secret gifts by putting what in people’s shoes during the night? Which of the following is a name Santa Claus might go by in Russia?